Being a MADMAN means never having to say you’re crazy. You can’t be crazy and be an Original MADMAN. You might do crazy things early on…that’s how you learn. It’s a constant balancing the left brain with the very dominant right. MADMEN tend to be “A” personalities, a little nuts, weird, wired and may appear to be introverted and extroverted simultaneously. 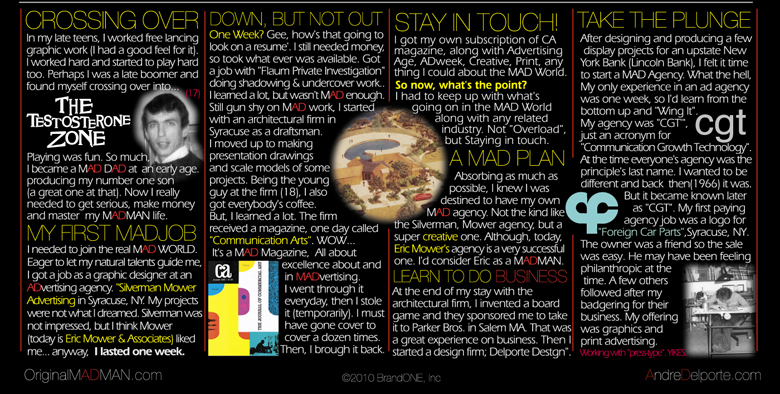 An Original MADMAN is an outside in thinker and that’s tough with most clients who are usually inside out thinkers. Finding true common ground with a client is probably the biggest challenge to overcome. MADMEN might talk to themselves a lot, animated and over dramatic. This is because a MADMAN might have solutions to the marketing problem before a client can wrap their arms around it. LIVINGMAD, you must live life, experience it, associate with all types of people, and never be discouraged when people scratch their heads as you’re making a presentation.